Amy Blakeney has been hired by the Wisconsin Farm Bureau Federation as the new district coordinator in south-central Wisconsin. Blakeney will be responsible for working with county Farm Bureaus to develop and implement programs to serve Farm Bureau members and to coordinate membership recruitment and retention efforts. “I am excited to join the Wisconsin Farm Bureau family as the district 2 coordinator. I looking forward to this opportunity to work with Farm Bureau members and am committed to helping each county achieve their goals,” Blakeney said. Blakeney will serve Farm Bureau’s District 2, which includes the counties of Columbia, Dane, Dodge, Green, Rock and Sauk. She began her duties on March 17. 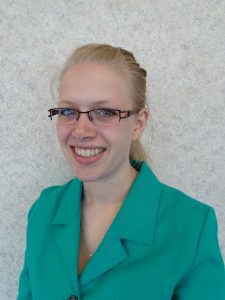 “Along with her leadership experience as a Farm Bureau volunteer, Amy’s enthusiasm for agriculture and her diverse farming experience will serve her well as she works with the county Farm Bureaus in south-central Wisconsin and with the collegiate Farm Bureau chapter at UW-Madison,” said Bob Leege, Wisconsin Farm Bureau’s Executive Director of Member Relations. Blakeney (formerly Roden) grew up on a dairy farm near West Bend. She and her husband, Chris, live with their two daughters near Janesville in Rock County. They raise beef cattle and produce with his parents on Amazing Grace Family Farm. Blakeney is a graduate of the University of Wisconsin-Green Bay with a bachelor’s degree in organizational communication. She has been an active Rock County Farm Bureau member, serving as its Ag in the Classroom Coordinator for two years. In 2009-10, she served as an ambassador for the honey and beekeeping industry on the state and national levels. Most recently, she was employed at Mid-State Equipment in Janesville. Blakeney succeeds Kelly Sime of Ripon at WFBF. The Wisconsin Farm Bureau Federation is the state’s largest general farm organization, representing farms of every size, commodity and management style.